Baron Hans-Heinrich von Thyssen-Bornemisza, Lugano. Anon. sale, Sotheby's, London, 17 June 1992, lot 340. R. Delevoy, C. de Croës, G. Ollinger-Zinque, Fernand Khnopff, Brussels, 1987, no. 476, p. 366 (illustrated p. 367). London, Piccadilly Gallery, Symbolist and other works by Belgian artists c. 1880-1940, 1982, no. 41. 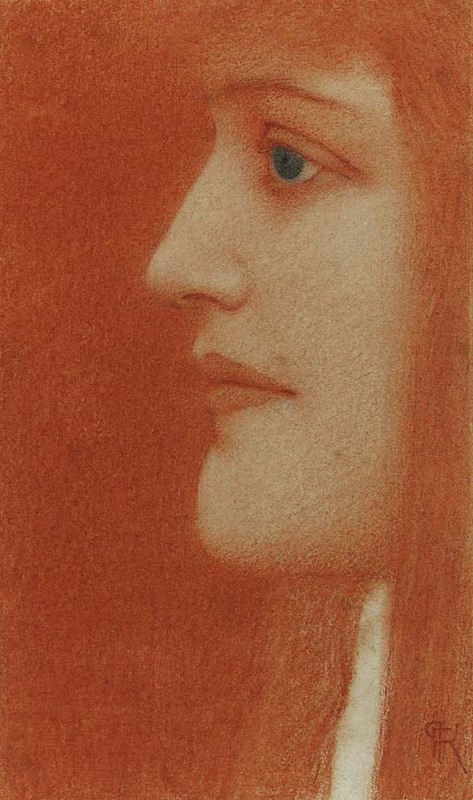 Wilmington, Delaware Art Museum, Fernand Khnopff and the Belgian Avant Garde, 1984. This exhibition later travelled to Chicago and New York. Newport, Newport Harbor Art Museum, Flemish Expressions: Representational Painting in the 20th Century, December 1986-February 1987, no. 41. Please note the present work is hinged twice to the mount at the reverse upper sheet edges, not laid down on paper as the catalogue indicates.